Will all believers in Christ end up in Israel one day? August Rosado: Brother, it's so good to have you back on the show! I've been looking forward to this for a while now. How's everything going there at Lamb & Lion Ministries? Nathan Jones: Ministry has been really busy, for as you know, so many people have been getting interested in what's going on in the world. Even people who are not really knowledgeable about the Bible see and understand that something big is moving in the world and they want to know where it's all going. We are so fortunate as believers in Christ to have the Bible, and 31% of the Bible is God's prophetic word. God wants us to know what the future holds, more or less not in extreme detail, but as much as God wants us to know. It's just great to share the Gospel with people as we proclaim God's prophetic word and hope-giving message of the soon return of Jesus Christ. August Rosado: Amen, Brother! That's what Bible prophecy is all about — sharing the Gospel of Jesus Christ to a lost and dying world. And, yes indeed, something big is happening in the world right now, and it's telling me that Jesus Christ is coming sooner rather than later. There's so much going on right now that the one hour we have together just doesn't do our conversation justice. We could go on for the next three hours and still talk about what's going on in the world right now, especially in Israel, the Middle East, and even in our very own backyard. I believe current events are setting the stage for Bible prophecy to be fulfilled. Now, tell me, Lamb & Lion's Senior Evangelist, Dr. David Reagan, just came back from Israel, right? He lead a tour and also went there to shoot some "Christ in Prophecy" programs? Nathan Jones: Yes, he did. Dr. Reagan leads tours to Israel one or two times every year depending on conditions. We'll have another tour in or around March 2014, and we are also going to have another tour of Israel near the end of October and beginning of November of 2013. It is still tentative right now, but if people want to come and join that tour, they can go to our website at lamblion.com and at least get on the waiting list as we get more information together. August, when you said that your ministry will host a tour of Israel in March 2014, it might be a whole different-looking Israel by 2014. August Rosado: Yes, that's right, taking into consideration what's going on over in Israel right now, anything could happen. After all, it is the Middle East! Today in Bible Prophecy just got back from Israel this past March and we just had a wonderful, wonderful time. We had a great group of people join us on the tour. Like I say, there's nothing like teaching Bible prophecy on location, where it was all written and where it is all going to come down. We just had a wonderful time with this group. I look forward to going back there again, unless the Lord takes us home, that is. Nathan Jones: Amen, Brother! And then, we will all still end up in Israel one day, right? 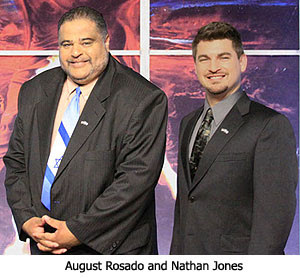 August Rosado: We will end up in Israel. I told people in our tour that if we get raptured in Israel it's only going to be a domestic flight. I tell people that all the time. In the second segment of August Rosado's and my discussion of current prophetic trends and events, we will get to it and lament the Boston Marathon bombing, as well as see if terrorism in these last days was prophesied in the Bible. Cool! I guess I will be able to call myself an Israeli someday! I am a new creation, with Christ as my life, without spot or blemish, bound for my everlasting heavenly home, a family member, a child of my Father, and part of His household. The earth is not my home. Earth is just a temporary schoolhouse, where I am passing through. I will be able to visit earth with my glorified, spirit body, but MY HOME will be in heaven. Much much better, to be part of Father's household, than to be part of an earthly people, whether Israeli's or not. My eternity is as a "son" of God in His house. I was re-born to be able to enter His house, with Christ as my Life. A new creation.